On Windows and Mac OS X, the native print dialog is used, which means that some QWidget and QDialog properties set on the dialog won't be respected. In addition, aside from the DontUseSheet option, the native print dialog on Mac OS X does not support setting printer options, i.e. QAbstractPrintDialog::setEnabledOptions() and QAbstractPrintDialog::addEnabledOption() have no effect. Adds the button to the layout of the print dialog. The added buttons are arranged from the left to the right below the last groupbox of the printdialog. Returns a pointer to the printer this dialog configures, or 0 if this dialog does not operate on any printer. 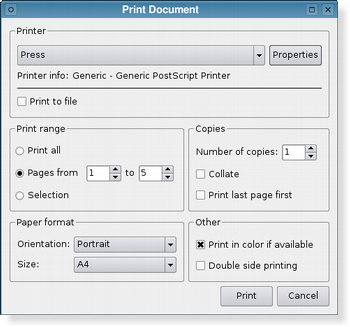 Sets this dialog to configure printer printer, or no printer if printer is null. 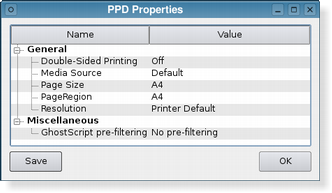 If pickupSettings is true, the dialog reads most of its settings from printer. If pickupSettings is false (the default) the dialog keeps its old settings.